I live in Maryland. We love our blue crab here. When our beloved Ravens were in the Superbowl hunt, crab was scarce because everyone was making hot crab dip for the big game. You think I’m exaggerating? During the playoffs, I ventured to 4 different stores to find lump crab meat on game day, and STILL came up empty. I totally learned my lesson and bought some earlier in the week for the next game. Hot crab dip is like buffalo wings here. Everyone has their own recipe they make at home, but one thing you’ll find is that generally, people are unhappy with restaurant dip. It’s mostly “filler”, with too much cheese or mayonnaise. Nary a “jumbo lump” to be found. Disappointing. I realize crab can be expensive. Around here, crab goes for $16 to an eye popping $44 a pound. But, when you are paying $14 for a very shallow bowl of dip, you should be able to identify a few chunks of crab! My recipe is a bit different from others. I don’t like green or red peppers in my dip. Peppers, to me, are overwhelming, especially to the sweet and delicate crab meat. I also don’t like cheddar cheese. 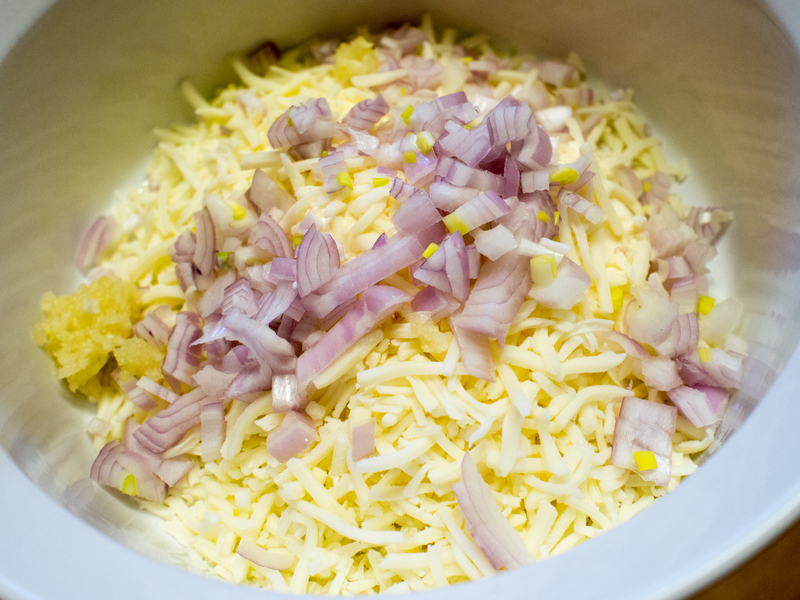 You can sub the Monterey Jack cheese I use in the recipe below if you prefer cheddar, but the reason I don’t use cheddar is that it’s not a smooth melting cheese and tends to clump together. Especially as the dip cools. When you dip a cracker in a hot dip that uses cheddar, you sometimes get an unsightly mass of cheddar cheese. Not ideal. Also, and this is a pearl-clutching statement for a Marylander, so brace yourself: I don’t like Old Bay. It’s just too much. To me, it ruins everything it touches. Old Bay is a bold and aggressive seasoning that lacks sophistication, especially for a very subtle dish like crab dip. I realize what I’ve uttered is heresy in these parts. I’m ok with it. I also used pasteurized crab meat in this dish. I know, gasp! Look, I could spend 1/2 an hour picking through meat looking for shells. Or, not. Pasteurized meat tends to not have shell in it (you still need to be careful with it, as you do get a few), but some think it has a slightly off flavor. There’s so much spice and flavor in this dish, the pasteurized crab won’t make a difference. Now, were this a no filler type crab cake or a cold crab dish, I probably wouldn’t use it. I don’t really taste much of a difference between pasteurized and fresh crab meat, honestly. Let me clarify that I mean pasteurized crab. It’s usually right next to the fresh crab. Not canned crab. I’ve never used that, so I can’t comment on it. My perfect crab dip is creamy, loaded with crab, with a touch of spice hitting at the end. A completely ultra lux experience. So, in my dip I have mayonnaise and, optionally, cream cheese. I made two versions of this. One was slightly runny, but excellent. The other was thick and creamy and also excellent. I went with thick. The only difference is the addition of the cream cheese. If you don’t want an extra thick dip (or don’t have cream cheese handy), leave it out. 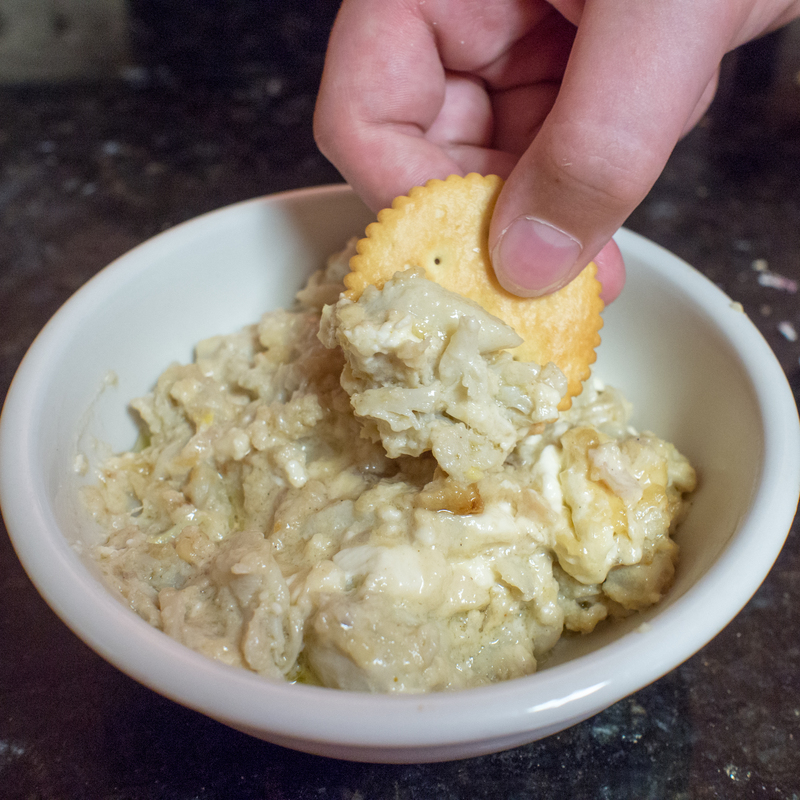 Combine all the ingredients in a baking dish except the crab and crackers. 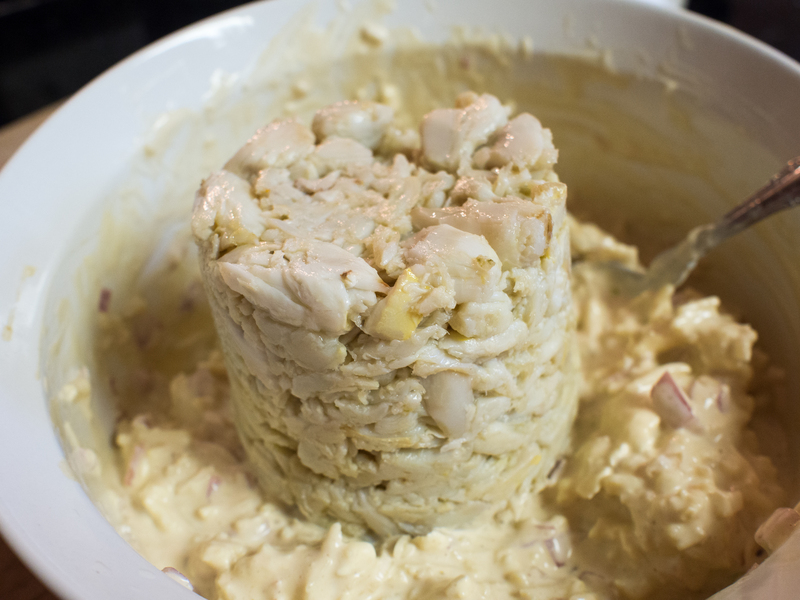 After the mayonnaise mixture is thoroughly combined, gently fold the crab meat into the mixture. This preserves the “jumbo lump” you paid for. Bake until bubbly, about 40 minutes. Serve with crackers or toast points. This entry was posted in Appetizers, Seafood and tagged appetizer, Crab, crab dip, Crab meat, Cream cheese, dip, hot crab dip, Maryland, Monterey Jack, Ravens, Worcestershire sauce on June 29, 2013 by dawn of food.